Each year, Rural Metro brings their firetruck across the street and squirts Kindergarten and 1st grade. This year, our Pre-Schoolers joined us. As you acn see, we had a blast (no pun intended). Some of us even played in the mud. Our 8th grade basketball players played two basketball games against the staff. One game was fro grades K-4 and the other was grades 6-8. The cheerleaders preformed their cheers and cheer competition routine. Dusty, our mascot made an apperance, and even some teachers thought that they were cheerleaders. 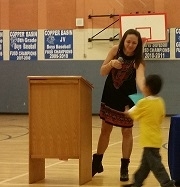 For our 4th quarter award assembly we give out special awards that describe our students. These awards range from super story writer, to best smile, to nice handwriting - just to name a few. We also recognize the parents who have regularly volunteered their time throughout the school year. To celebrate our last few days as 1st graders, we popped balloons for the last six days of school. Each balloon had a fun activity - dance part, shaving cream party, bubble gum contest - just to name a few. We had so much fun celebrating our last few days together as a class. 1st Grade did a dinosaur study the last few weeks in May. To end the study we, watched a dinosaur movie as a grade level and then did some dancing to dinosaur songs. We had a blast! The final combined Anthem/Copper Basin band concert was held on May 12, 2015 in the Copper Basin cafeteria. Wow have all the bands grown this year! The highlight of the evening was when the 7th and 8th grade band played Queen's Bohemian Rhapsody. Thank you Mr. Kirchoff for directing the bands this year! Mrs. Callahan's 1st grade made cards congratulating Mr. Bock on becoming our new principal. We tricked him to get him to our room, and then presented him with all of the cards we made. He told us that this was the highlight of his day. Copper Basin's Annual 8th Grade Promotion Dance was held on Friday, May 8, 2015. This year, PTO planned a Masquerade theme for the 8th graders. Everyone had a blast at their last K-8 dance and are looking forward to high school dances. 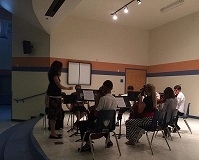 The final Orchestra concert of the year was preformed on May 7, 2015. Even though the orchestra is rather small, they sounded wonderful. Thank you so much Miss Doll for directing the orchestra this year. On our last Early Release Day training, we had a PBIS teaser. We played Family Feud to get us into the mindset of PBIS for next year. Mr. Bock did a great job playing host and presenting the questions and making us all laugh. We had our last lunch with Mrs. Callahan on May 5, 2015. Each time we received a blue for our behavior, we received a gem. After five gems, we retired that clip, got a new one, and had lunch with Mrs. Callahan in our classroom. We LOVED doing this and would always want to know when we would be having lunch together. This time there were so many of us that we couldn't fit at the horseshoe table, so we had to have a picnic on the rug instead. On April 30, 2015, our 1st grades traveled to Schenpf Farms to learn about where vegetables come from. We got to pet their animals, take a hay ride and learn about the history of the farm, and pick Swiss Chard. We had beautiful weather and had a fantastic time! We look forward to going again next spring. Our National Junior Honor Society sponsored a car was for our recess/lunch monitor Gene. Mr. Gene has been diagnosed with skin cancer and the car wash helped to give Gene and his family funds to helppay for some of their expenses during Mr. Gene's treatments. To end our unit on Earth Day, we did a reduce, reuse, and recycle sort. Each table was given a variety of items that needed to be sorted into the correct container. When these sorts were done, we hung them around our classroom for a little bit as reminders of what to do with our trash. Parents and students came out on April 16th to play math games that correlate to the Common Core math standards. There was cards and dice games as well as origami. Everyone had a blast! The PTO's Spring Carnival was a fantastic even this year! The weather was beautiful and everyone who attended had a wonderful time. There was a dunk tank, rock wall supplied from the YMCA, bounce house, velcro wall, bungee slide, carnal games, cotton candy, and face painting. The choir and cheerleaders preformed. Some teachers and administrators even kissed a pig or went to jail. The 4th graders used pattern blocks to create symmetric patterns. The students had a blast creating these shapes. As our third quarter drew to an end, we celebrated by watching our annual Staff VS. Student Volleyball game. The cheerleaders preformed their routine from the district championship. Our mascot, Dusty, was in attendance and got the crowd pumped up. Rumor has it that the staff won both sets of games - K to 5 and 6 to 8. One 8th grade science project that has had wonderful results each year is the plant and animal cell projects. The students make cells out of play dough or edible items like cake or jello. First grade was fortunate enough to have a retired first grade teacher, who was wintering here from North Dakota, come and help three days a week for an hour and a half. Mrs. Sailer divided her time between the three first grades at Copper Basin and worked with their reading skills. She read chapter books with some of the high readers and worked on sight words and basic reading skills with the low readers. She even helped us with story structure and sequencing. We are going to miss Mrs. Sailer, but we made her cards thanking her for her help. One of us little ones even asked her to come and help us next year when we are second graders! To bring our two week graphing unit to a close, we created our own color graphs and surveyed the class. We found it interesting when people liked a color that wasn't on our graph. 8th grades dissected frogs while Ms. Passmore's 4th grade science classes watched. We don't know who had more fun! This week we were able to play a new game called shake, shake, drop. It is an addition game that allows us to find all of the different sums to 5, 6, 7, 8, and 9. We had a great time playing g with our partners and using the white boards for the writing part. We love math games in B102! In celebration of successfully meeting the third quarter's AR goal or sight word goal, we combined grade levels for a half hour dance in the gym. A fun time was had by all who were able to attend! This week Mrs. Kirchoff's and Mrs. Trakas' classes worked together to make our beautiful quilt. We learned about the season of Spring and worked with water colors. It is fun to paint and to learn with our friends! Spring has sprung in Kindergarten! 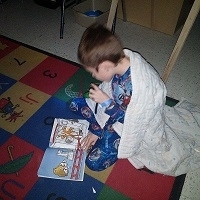 To bring our Dr. Seuss I LOVE to Read week to an end, 1st grade wore their jammies, brought a blanket, their favorite book that they could read, a stuffed animal, and a flashlight. We turned the lights out, crawled under or on our blankies, took out our flashlight or read by the campfire. We had a blast! On Friday, March 6, 2015, Copper Basin had a pajama day to raise funds for Dr. Smith and her son's kidney surgeries and to bring our Dr. Seuss I LOVE to Read Week to an end. The students, staff, families, and district employees helped raise over $1,000.00 for the Smith Family. Wow! Did we celebrate Dr. Seuss this week. We read a different Dr. Seuss book each day and had special snacks or activities that went with the day's book. We made Cat in the Hat hats out of strawberries and bananas; we ate green eggs and ham; reviewed money by making Seuss hats; we ate and became the Lorax; and ended the week making oobleck. Great memories were made this week! In the Middle School Division at the Southern Arizona Research, Science, and Engineering Foundation (SARSEF), Copper Basin K-8 has four students who have won awards and cash prizes. In the Elementary Division at the Southern Arizona Research, Science, and Engineering Foundation Copper Basin K-8 has three 3rd grade students who have won awards! This week we went to the dairy farm! We learned a lot about cows and farming. Did you know that cows have four stomachs? It was awesome! Kindergarten kids had a blast on our field trip! Rainy Day schedule can still be fun! Copper Basin 6th graders posed for a picture before school in Ms. Stavn's room when they were called inside due to rainy day schedule. On rainy days, the kids go to their teachers' classes before school and still enjoy time to socialize with friends during their lunch break in the cafeteria and the gymnasium. This week we celebrated Valentine's Day! We had a great time making our quilt. We worked on matching shapes and making triangles from squares. Ms. Stavn's 6th grade students showed their school spirit February 9th-13th for Copper Basin Spirit Week. For Spirit week Monday was Hawaiian Day, Tuesday was Hat Day, Wednesday was Twin Day, Thursday was Jersey/Sports Day, and Friday was Red or Hearts Day for to represent Valentine's Day weekend. The pictures was taken Tuesday, February 9th and shows some of the various styles of hats (and ears) shown off in celebration of school spirit! This week in kindergarten, we learned about the "ox" word family. We used playdoh to help us create the words in this word family. We gave so much fun learning about word families in B102! On our Early Release day, Mrs. Callahan's 1st grade and Mr. Fehr's 4th grade got together to watch "The Snowy Day." We also created a cause and effect project that we hung in the hallway. At the beginning of the second quarter, the first graders were given a project to work on at home with their parents. This project was about an object in the sky. Many of the first graders did their favorite planet. Some did rockets, and others even reported on clouds. Not only did we learn a lot about space, but we also learned to be good listeners. One of our parents gave us clay so we made a gift for our parents for Valentine's Day. We had a blast sculpting and creating! Each year, our Title 1 teacher organizes a fantastic Bingo for Books. This year, Mrs. Bolton out did herself! Hot Dogs and soda were sold before so families could come and have dinner together and then play Bingo. Mr. Fehr did a marvelous job calling the letters and numbers. Everyone went home with at least one book and everyone had a blast! Copper Basin celebrated the 100th day of school with many different activities. We had our second quarter award assemblies, 1st grade dressed up as 100 year old grandmas and grandpas and paraded through the entire school, while other 100th day activities took place in the different classrooms and grade levels. Our 6th-8th graders enjoyed our Winter Dance this week. The music was provided by Magic DJ. The Pre-K students learned about the different kinds of tools and trucks construction workers use to build things. They enjoyed pretending like they were operating the trucks at one of our centers this week! This week we have been working on addition strategies. We have been using counters, number lines, and drawing pictures. Its fun to be hands on in kindergarten! 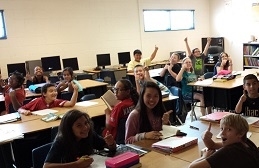 Educators who participated in the iCivics Arizona Program and tracked their student totals on http://www.lawforkids.org/News-Flash/i-civic-it for a free McDonald’s Smoothie Coupon (Sponsored by McDonald’s), were automatically entered into the iCivics Arizona competition. Below are the top 3 educators whose classrooms tracked the most minutes during this time frame. Thank you to everyone who participated and encouraged their students to play the iCivics games. We look forward to your participation next school year! Each holiday season, the Copper Basin staff celebrates with a potluck luncheon and Secret Santa. We always have a blast with the Secret Santa. The potluck show cases the wonderful cooking abilities of our staff, and we have a great time with each others' company. At the end of every sports' season, the staff play the students in a game of that quarter's sport. This quarter, the teachers played a game of soccer. Wow! It was a fascinating game! The teachers beat the students again this year. Santa stopped by Pre-School and Kindergartens on his way to Mrs. Callahan's 1st grade for breakfast. First Grade won the PTO's Box Tops for Education contest this past quarter. The class that brought in the most box tops won Breakfast (doughnuts) with Santa. Each student in Mrs. Callahan's class got to sit on Santa's lap and tell him what they wanted for Christmas. Thank you PTO for the doughnuts and visit from Santa! We celebrated the end of the first semester and the upcoming holiday season with two assemblies (K-4 and 5-8). Our band and orchestra played holiday music, and our choir sang a few holiday songs. There was a "Name that Tune" contest with teams consisting of a teacher and two grade level students. One of our parent, Mrs. Udy, played the piano and the first team to ring the bell and answer correctly received a point. We also had teams of a teacher and grade level students wrap gifts and use a scooter to place the gifts under the tree. The first team to wrap their gifts and place them under the tree won. We ended with "Twas the Night before Winter Break" read by Mrs. Fant and acted out by Mrs. Pike and school staff members. We even had a special visitor - Mrs. Gooday returned to be our Santa. We had our polar express pajama party! We got to drink hot chocolate and have cookies and treats! We even got a special visit from Santa! Kindergarten is so fun! Happy holidays! In preparation of viewing The Polar Express and to review many of our math standards from the first semester, Mrs. Callahan's 1st grade did many Polar Express themed math centers. We made trains out of different shapes, skip counted by 2's 5's and 10's with trains, and played an addition matching game with silver bells and children in pajamas. It was a great way to end our math centers this month. On Wednesday, December 10, 2014, Carolyn Coffey from the KNIX morning radio showed up to present Mrs. Anderson with the "Teacher of the Week" award. Mrs. Anderson was nominated for this award by Shannon Weber and her son, Dustin Aterbury. The weather was not as cooperative as all would have hoped, but the Polar Fest Parade was fantastic! Each grade level had a prince and princess represent them in the Copper Basin Float. We even had a King and Queen to represent our school. We celebrated a super soccer season with a Pep Assembly. Both the boys and girls teams were recognized and some fun competition was had. Looks like there was some pie on a few faces. 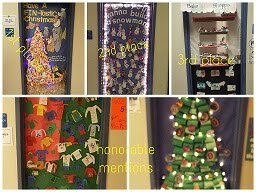 Every year, we have a door decorating contest and it gets very competitive. The winner again this year was Mrs. Carr's 8th grade. Our speech teacher, Mrs. Warburton came in second, and Mrs. Callahan's 1st grade came in 3rd. This year, we had two honorable mentions: Mrs. Kranich's 5th grade and Mrs. Campbell's Special Ed classes. Next year, we will all try again to beat Mrs. Carr's 8th graders! The Copper Basin and Anthem bands came together on Thursday, December 4, 2014 to preform a selection of holiday music. Forty-five minutes before the concert the two school bands came together for the first time to practice the music as one band. Mr. Kirchoff did an amazing job at teaching all the different bands. There was a fifth grade beginners band, a sixth grade intermediate band, and a seven/eighth grade advanced band from each school. It was a wonderful evening. This week our two classes got together to make our monthly quilt! We made snowmen for winter. It's fun to get together with our friends from other classes to work on a project. We work on our listening skills, following directions and patterning. It's beginning to look a lot like winter! To get into the holiday spirit, we completed job applications to become one of Santa's elves. The students had to complete a few questions: have you been naughty or nice, do you like cookies and milk and write a paragraph explaining why they would make a good elf. Then they had to draw a picture of them as an elf. Boy, this was serious work! Every year, our Student Council does a fantastic job creating a fun experience for our Turkey Day Activities. Each grade level has three different activities to complete and there are a few different grade levels outside at a given time. The students have such fun completing these activities. This week we spent time being thankful. We did a lot of art projects for thanksgiving. We had fun with paint and crayons and glue! So many turkeys! Happy Thanksgiving to all! Every year, we are asked to decorate our classroom doors. this year, we decided to turn our classroom door into a bakery. We made cookies on cookie sheets to place in the oven. We even had cookies on plates and in boxes. We had SO much fun creating our door this year! During November, 1st graders worked on a family tree project at home with their parents. These projects contained pictures of their families, drawing of their homes, and even flags that represented their family. Once they were brought to school, each student presented their family tree project and the projects were then hung in the hallway. The weather held out this year for our second annual Turkey Trot. Mrs. Jimenez did a wonderful job organizing this year's turkey Trot. Each grace level was given a specific time slot to be outside running around our sports field. Each grade level had a first, second, and third place winner for their first lap around the field. Everyone had a blast and many teachers were running ride beside their students! On our Early Release Days, Mr. Fehr 4th grade and Mrs. Callahan's 1st grade get together to do buddies. Sometimes we read to each other, sometimes we celebrate holidays together, and sometimes we do crafts together. On November 19, 2014, we celebrated Thanksgiving by creating a glyph. We colored certain parts of a turkey a certain color depending on how we answered a certain question. We had a great time with our buddies! What a fantastic turnout we had for our school wide science fair. Grades Kindergarten through 2nd completed a grade level project, while students in grades 3-8 did individual projects. The projects filled our gym and many parents and family members came out to see the great work that our students did. There were many 1st to 3rd place projects. Great job Dust Devils! This week kindergarten students participated in their first science fair! We were so excited to do our experiment in class. The kids in B102 love to learn about science! Each week in kindergarten we work on reading centers. Sometimes we make a book or practice our letter of the week. We also get a chance to use the computers each week. The kids also get pulled into small groups at this time. These kindergarten kids are getting better at working independently each week! Our most recent reading standard is ABC Order. During our Enrichment time, these students were working together to put 26 animal cards in ABC Order. They loved working together and trying to be the first group done with their cards in the correct order. A great time was had by all at this year's Halloween parade. Grade Kindergarten - 5th grade dressed up in their best costumes and paraded around Copper Basin K-8 while many parents, siblings, aunts, uncles, and grandparents watched. We read the book, Skeleton Hiccups, and wrote about what we would tell the skeleton to get rid of his hiccups. We then used q-tips to create or own skeletons to accompany our writing. We had another great week in B102! In kindergarten we love to work with our student assistants. They work on letters, sounds, and sight words. The best part is that the kids think they are just playing games! Our student assistants seem to enjoy it too! We will keep working hard in kindergarten with the help of our student assistants! Ms. Stavn's 6th grade science classes began working on their Science Fair trifold boards on October 28th, 2014. They are preparing for the Copper Basin Science Fair, November 18th, from 6:00-7:30 pm. The 6th graders are doing their individual projects on a wide range of topics such as robotics, the environment, and health and medicine. The students have been putting forth a lot of hard work and have been learning a lot about the Scientific Method. They are excited to put all of their hard work on display. Winners of the Copper Basin Science Fair will be eligible to go on to compete in the FUSD District Science Fair and then on to a state competition in Tucson in February where a wide range of prizes will be available for the winners including iPad, $500 cash, and more! We would like to say thank you to all of the parents who have made an investment toward their child's success. Your support is greatly appreciated. We went on our field trip to the pumpkin farm! We had so much fun! It was hot, but we had a great time! Kindergarten field trips are so fun! A great time was had by all of the 6th-8th graders who attended the Halloween Dance. We had yummy food to eat and fantastic music to dance to. There was a costume contest with some pretty amazing costumes! In Mrs. Trakas’ class we do fun math centers each week. This week our centers were based of our pumpkin theme. We have 6 centers and we rotate through each one. One center is where we subitize, which means we practice seeing numbers quickly. This week we rolled our dice and colored pumpkins that had that number on it. Another center that we do is practicing sorting. We sort numbers, shapes, etc. This week we were sorting pumpkins by size. We also get to use the computers for one of our centers. Our class learns different math games on more.starfall.com. We look forward to math center time each week! We celebrated all of our students with honor awards, attendance awards, Character Count awards, effort awards, and benchmark awards. Wow! We handed out tons of awards today! We even had parents join us for these assemblies. Ms. Stavn's 4th period Social Studies Class played a bingo review game to prepare them for their Mesopotamia quiz on Wednesday, October 22nd. The sought after prize was Dusty Tickets which the students can use for a free Homework Pass, Computer Time, Line Jumper Pass, Hat for a Day Pass, etc. There were many bingo winners but the students know that the real winners are everyone who got a good review for their Social Studies quiz. During the week of October 20-24, 2014, the Kindergarten and 1st grade classes went across the street to visit and tour Rural Metro. We got to see where they watch TV, cook and eat their meals, as well as seeing the fire truck. Miss Crecco was brave and got dressed in the fireman's uniform. "Boy it was hot in that uniform," she said. Did you know that bats are mammals? They are not birds. Our class learned all about bats this week. They are nocturnal animals. Nocturnal means they are awake at night. Our class also learned a fun song called Echolocation. This song was all about how bats find their food by calling out a sound and listening for the sound to bounce back to them. We made bats of our own out of our hands. It was so much fun! ABC Order can be a bit difficult when you are just beginning learning how to do it. If you have a little help from your friends at www.gonoodle.com and sing the alphabet before you begin to put words in ABC Order, it is much easier. 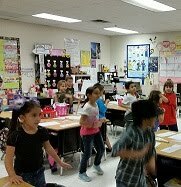 Here, we are getting our wiggles out while singing and dancing to Koo Koo Kanga Roo's "LMNOP." On our Early Release Day, the teachers were learning a bit more about RTI and the different tiers for the student interventions. We then broke off into grade level groups and began identifying students who will benefit from these interventions. Today, our buddies got together to read Fall and Halloween stories together. Wow! The 4th graders have grown into fabulous readers since they were in 1st grade. Some of the 1st graders even read to their 4th grade buddies. This week we spent time learning about our first word family. We got to make the "at" wheel and then read it to a friend. The kindergarten kids in B102 work hard every week! We can't wait to learn more and more word families. Whoo Whoo! 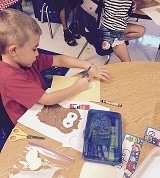 Yes, you guessed it, Owls were the theme in Mrs. Trakas’ classroom our first week back from Fall Break. The students learned all kinds of new vocabulary about owls, including the words nocturnal, oviparous, talons, and raptors. The class was asked a question each day for three days. 1. Have you ever seen a real owl? 2. Are you a night owl? 3. Are you afraid of the dark? Each student then made an owl glyph to represent the answer to their question. We also got to learn a little more about all of our friends in our class. The project was lots of fun and included many different subject areas. In preparation of Fire Prevention Week, Mrs. Callahan's 1st grade made toilet paper tube dalmatian dogs. These dogs are to help us to be safe around fires and to "Stop, Drop, and Roll" if we are ever on fire. This is a picture of Jessalyn Payne, Mya Moore, and Chaz Escobar reading a story with a parent volunteer during reading centers. In B102 this week, we spent time learning about the letter Bb. We got to work in a small group with our friends trying to come up with pictures that begin with the letter Bb. We love to work with our friends and learn new things! We also tried to write the words by sounding out the letters. Kindergarten is so busy this week! This is Jasmine Coronado, Ricky Trujillo, Dominick Espinosa, Nicholas Turner, and Kayla Gonzalez in B106 listening to a story during reading centers. They certainly loved the book! This week in Mr. Navarro's Reading Class, students explored the standard of expository text. We used I-Pads to explore a website about habitats of the world, and students answered questions by locating information from the website. Students were given key words or clues to help them navigate their way through the website using text features such as headings, sub-headings, and captions. It's already been six weeks of kindergarten! We are working hard in our classroom. We use our Promethean board everyday. The kids love to use technology in our classroom! We also spent time this week working on counting quantities. We got to find a group based on our tens frames. We love hands on activities. On Friday, August 22, 2014, the Copper Basin community got together to celebrate the "A" rating the school received. Each grade level was asked to bring a certain item from hot dog buns to chips to cupcakes as well as many other items. Mr. Navarro and some of his friends got together off the cafeteria and grilled hot dogs to perfection. Mrs. Maher was seen setting up drinks, while Mr. Bock checked that everything was going smoothly. Mrs. Pike was even seen cleaning up after everything was finished. From the looks of it, a great time was had by all! During the month of August, 1st Grade has been learning about Arizona symbols as well as National symbols. Today, we watched a video by an Arizona Representative discuss some symbols of Arizona. After we completed the video, we drew our symbol and began writing an explanation of our drawing. Ms. Stavn's 3rd period Social Studies class got their hands dirty making Egyptian papyrus from recycled newspapers and other materials in room C108. Papyrus was a reed that grew in abundance in the shallow water of the Nile and was used for making baskets, boats, pens, and paper. The students plan on using theirs for future Egyptian art projects and hieroglyphic writing activities to be displayed at our upcoming Ancient Egypt night (date to be announced). Mr. Garber and his 7th and 8th graders attended the activity and he assisted the kids as well. We would like to thank all of the parents who donated materials to make it possible! This week in Mr. Navarro’s Math Enrichment class, students were challenged to create their own division problems. Students worked in groups of three to come up with information to create a problem. Once the problem was created, they then had to work together using a strategy they learned in their math class to find the quotient. In the picture shown, the group decided to use the equal sharing strategy to solve their division problem. Ms. Stavn’s 3rd period Science Class was enriching their lesson on weather and the atmosphere by creating 3 dimensional diagrams of the major types of clouds out of cotton balls in the 6th grade Science lab, room C108. The students are beginning their journey into meteorology by learning that "clouds and weather go together". Now that they have mastered cloud classification ,they will be gathering data throughout the week about the types of clouds that they see and the weather that accompanies them in their "Cloud Collection Charts". It's an exciting time of the year to do this because of the changing monsoon season weather. Mrs. Callahan's 1st grade ventured off to Mr. Fehr's 4th grade classroom to meet their buddy for the first time. The teachers paired the students together, and they then worked on a "get to know you" activity. Each student filled in a handprint with information about themselves. Once these handprints were filled in and colored, they were exchanged and hung in their buddy's classroom. The buddies will be getting together on some of our early release days to do fun activities together. 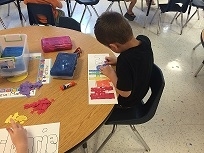 Mrs. Trakas’ Kindergarten class wrapped up our All About Me unit with our, A my Name is activity. For this activity we read a story called A My Name is… and another story called We are All Alike…We are all Different. Our class had a great discussion about ways we are alike in our own classroom and ways that we are different. Students created themselves by drawing a circle and then painting their skin color. Then they discovered what eye color and hair color they had and created a face onto their circle. At the end, they wrote ___my Name is_____ onto the bottom of their likeness. We found out a lot about each other these past two weeks. This week we spent time counting quantities in a variety of ways. We used cubes, tens frames and dice. This was a fun dice game we played. We also got to practice writing numbers as well! That's a two for one! Its been another great week in B102. In the 6th grade Science lab, room C108, Ms. Stavn’s 5th period Science Class created Interactive Notebooks to be used along with the 6th grade Science curriculum throughout the year. This day they were decorating the covers, creating a table of contents, and numbering the pages to create a portfolio of the learning that takes place this year. They look forward to filling them with new and exciting information about the world around them. On Saturday, August 16, 2014, the K-3 teachers from Copper Basin and Anthem came together for the first of three AMP math trainings. For the first training, the teachers worked very hard to think in base four. This was a difficult concept because most people think in base ten. It helped the teachers realize how difficult it is for young students who are just learning their numbers and quantities to think in base ten. The teachers are looking forward to their up coming trainings. This week in Mr. Navarro's Reading class, students dove deep into the subject of syllabication. Students practiced our new Cornell Notes taking strategy and then had the pleasure of doing a syllable word sort. Students had a great time cutting out words and gluing them underneath the syllable rule that the word follows. Mr. Navarro was then able to determine if the student had grasped the skill by checking their word chart. 5th graders playing multiplication war to review and reinforce multiplication facts. During the course of this last week students were studying the trait of organization in their writing. As a wrap up activity, students were asked to write a short story using sequence words to move their story from one event to another. However, they had to work as a group incorporating the ideas of all members. After completing their stories the groups were asked to come forward and share the wonderfully creative pieces they had fabricated, with the class. In Pre-K we have been learning about families. Our M/W/F AM class discussed the different things we like to do with our families when we are all together. At one of our centers we drew a picture to show one thing that we enjoy doing the most with our families. The children then told about what they had drawn on their paper to complete the sentence "My favorite thing to do with my family is." Today we had a chance to color our weekly reading book on the floor. We love to color and read with our friends each week! We are learning some sight words and some letters. We also look at the illustrations to help us read. We are having a great time reading and learning in kindergarten! The first dance of the school year was on Tuesday, August 12, 2014. The Welcome Back Dance was for 6th - 8th graders and everyone had a blast! It was great to see so many students dressed up and dancing their hearts out to the music from Magic Music DJ. A great time was had by all Kindergarten to 5th grades students as they learned some awesome yo-yo tricks while hearing some great reminders of Character Counts. The students were reminded to: Never Give Up; Encourage Others; and Do Your Best! These two first graders, Aaron Monaghan and Jessalyn Payne, are enjoying the fabulous yo-yo performance by NED in the gym. Team Building: Our River Crossing activity is a physical challenge that requires a group to cross over a designated space. In this task the group travels across a "river" using a scooter(boat), two hula-hoops(islands), and a long jump rope. They have to work together as a team to figure out the best strategies to accomplish this goal!! This week in Mr. Navarro's 3rd Grade Reading class, the students capped off their prefix/suffix unit by enjoying an educational game of BINGO. Each student used one bingo card which had multiple definitions on each square. The bingo caller, Mr. Navarro, would call out words that had prefixes or suffixes and then the fun began. The students had to identify the meaning of the word called by using their decoding skills learned in previous lessons. If they were lucky enough to have the meaning on their card, they then would highlight the square. As always, five squares in a row equaled a "BINGO." Ms. Stavn's 3rd Block Science class performed their Lab Safety Poems, Songs, and Skits last Thursday, August 7, 2014. Each group was assigned a different set of rules or guidelines to follow in the science lab preparing them to begin doing science experiments in the near future. Each poem, song, and skit was unique and the students enjoyed watching each other perform as well as learning about lab safety! After successful data meetings, the teachers came together to begin learning about RTI. This training will help the teachers set up successful interventions to help all students achieve at a higher level and be successful. In kindergarten, we spend time learning on the rug. We sing songs every day! These kids are so excited to learn new things each day. They love to sing and learn! We also learned about shapes that have straight lines. They love working with a partner when we learn new things. 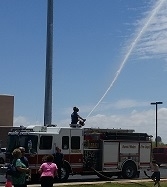 On Monday, August 4, 2014, Mrs. Pike had planned a big surprise for the Copper Basin students. Since this was the date that the state of Arizona releases the rating for the schools, Mrs. Pike and Mr. Bock had some amazing surprises up their sleeves. As Mrs. Pike stated in the August newsletter, "At our opening assembly last year (July 2013), we talked about goals and dreams. I told the students that my dream is to help them to be the best they can be and to provide them with the best education possible in a safe environment. My goal was to do every thing possible to help our school make even more academic growth. My promise to them was if they made growth, as measured on the AIMS tests, that I would have Copper Basin blue streaks dyed in my hair and coerce Mr. Bock into have Dusty, our mascot, shaved in his hair." At this school-wide assembly, Mrs. Pike showed off her new blue streaks and one of our parents, who is a barber, shaved "Dusty" into Mr. Bock's hair. The school was also treated to shaved ice from Kona Ice. Mrs. Gunther, a school parent and FUSD board member was also in attendance for this wonderful celebration. This week Mrs. Trakas’ class wore a special color each day of the week to celebrate our unit on colors. We wore all the colors of the rainbow. 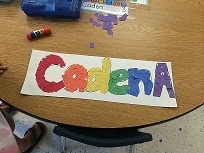 On Friday, our class made rainbow name mosaics. 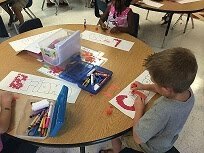 Each child received a large paper with their name in bubble letters. They were then instructed to put on their mosaic color tiles onto their name in rainbow order. The end result was each child’s name in red, orange, yellow, green, blue, and purple. Each child did a fabulous job and we will display them as we head into our All About Me unit the next 2 weeks. Our 8th graders scraped their cheeks and prepared slides to see Animal Cells, and they took a slice of onion to create a slide with plant cells. Then, they compared the two types of cells! In Pre-K we are learning that we can all be friends with one another. Our T/TH AM class examined each other’s fingerprints using magnifying glasses. The children first made a prediction as to whether or not they thought our fingerprints would be the same as our friends or different than our friends. After completing the activity the class came to the conclusion that our fingerprints are all different. The children learned that their fingerprints are just one of the many ways they are different than the other kids in our class yet we are all still friends. Pictured: Savior, Maci, Marcus B. and Memarie. Our new Librarian, Mr. Trejo. All 2nd,4th,6th have checked out books that are at their A/R level. The Kinder’z have really just been doing awesome in the library and are little pros at checking books in and out already. We read one book a day and summarize what we have read as a class. The kiddos also do drawing and writing activities during all classes pertaining to the curriculum. There is a new seating area with an ocean theme that they absolutely love where they can sit during story time on bean bags and relax to read a book of their own. Being a 6th Grader is COOL! Ms. Stavn's 6th grade class was happy to pose for a picture near the 6th grade hallway doors after lunch recess. They are enjoying having an "open lunch" for the first time where they have the choice to eat in the cafeteria or outside at the shaded tables. They are adjusting well to the choices by showing more responsibility! 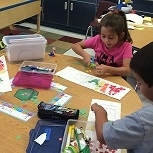 After two weeks of working hard at getting accustomed to 3rd grade expectations, students are enjoying an opportunity to make crafts and listen to music during BBQ time. Everybody enjoyed themselves and some beautiful works of art were created. 7th Grade Science creating food chains of producers, consumers, and decomposers. During our first week in Pre-K we learned about feelings and how different things that happen to us make us feel different ways. The students in our MWF AM class made faces with shapes to represent one of the feelings we discussed during circle time. They also all enjoyed making their own face look like all the different feelings we read about. Bella made her purple triangle into a happy face and Emi made her blue triangle into an angry face. Aurie, Delainy, Danaca, Brandan, and Tyler, adding details to our subtopics for our class web about the topic of music. All 5th grade students created a quilt square with their name and illustrations of some of their favorite activities, foods etc. Aurie, Delaney and Julia assembled the quilt with the help of Ms. Hannah. Introducing…the 5th Grade Team! Students playing “Sensory Rabbit” , an adjective game. Each team started with the sentence, I saw a rabbit. Each student added an adjective to the starting sentence. Play continued until at least three adjectives were added to expand the sentence. This week we are spending time learning about counting and numbers. 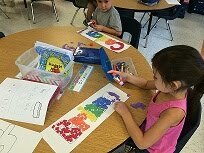 In this activity, the kindergarten kids worked together to make numbers that were the same as their partners. We have so much fun doing math in kindergarten! Working with a partner is the best! This is Addison Bainter during our computer time in the C125 computer lab! She was working hard creating and practicing patterns! 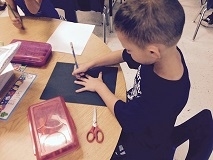 During the first week of school, Mrs. Narciso's second grade class worked on "Something About Myself." The students used a graphic organizer, and they drew their picture in the middle circle. In the four squares on the side of the paper, they drew and wrote what they like best. They used these organizers as a way of "Getting to Know You". This was on their 3rd day of school. Students went around and interviewed their classmates about their name, birthday and their favorites. Here are some sixth graders excited to work on their first big writing assignment the first week of school. They needed to write an autobiography to help Mr. Everett get to know them a little bit better. During our first week of 1st Grade, Mr. Bock, our assistant principal took the boys from each 1st grade classroom and reminded them of the procedures for the bathroom. He explained what the different items are in the bathroom and how we treat each other with privacy and respect while waiting our turn. Mr. Bock demonstrated had washing procedures and checked each step for comprehension.